Bikroy.com, the largest marketplace of Bangladesh has created a forum named ‘Moner Janala’ in association with ‘HeforShe’ campaign of UN Women to increase the number of female employees and to ensure women empowerment. 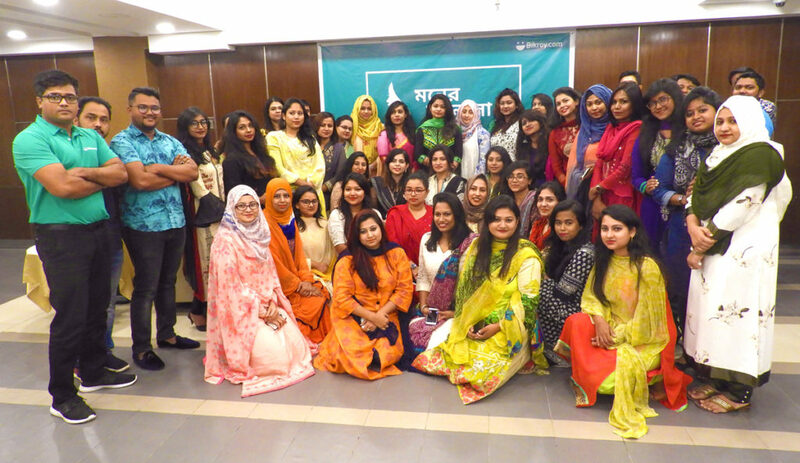 As part of this forum’s regular activity, Bikroy organized a special event for the female employees on Wednesday, 14th November at The Platinum Grand Restaurant in Dhaka. The Founder and Managing Director of Pulse Health Care Services and newly elected President of the Dhaka Chapter of TIE (TiE-The Indus Entrepreneurs Global), Rubaba Dowla was present as a guest at the event. Head of HR & Culture, Rehnuma Islam, Head of Marketing and Ad Sales, Eshita Sharmin and Head of Marketplace Shezami Khalil along with high officials of Bikroy were also present among others. Rubaba Dowla has more than nineteen years of experience in influencing all aspects of the Telecom and IT industry as a successful professional, entrepreneur, mentor and advisor. She is a highly experienced leader with a successful track record. As the Chief of Marketing and Chief Communications Officer, she had been instrumental in building Telenor subsidiary GrameenPhone as number one brand and market leader.